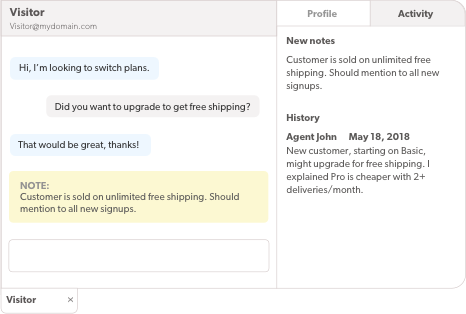 Agents can now add a Note to a conversation by using the !note command in the Olark chat console. 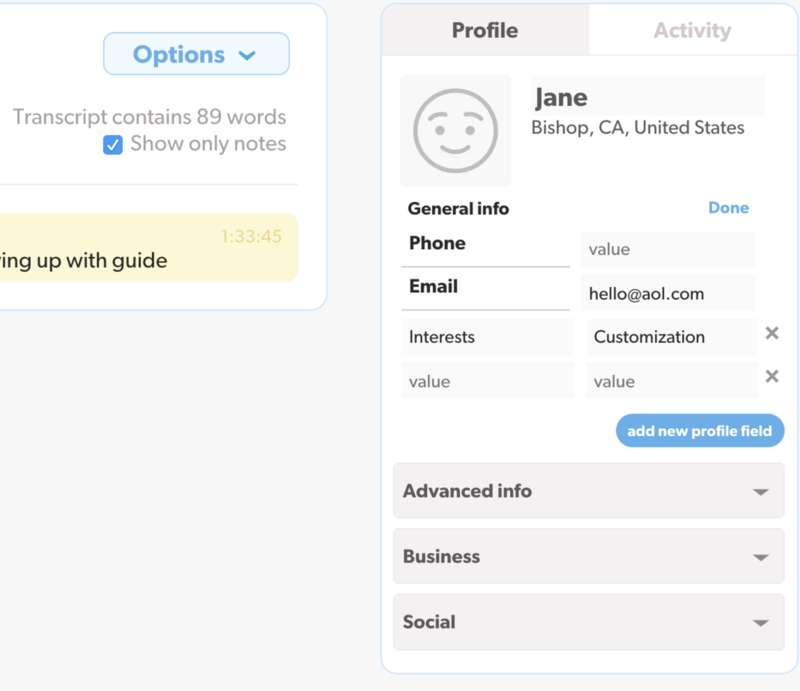 Agents on paid accounts will see a record of Notes from past conversations with a visitor under Activity in the chat console sidebar, and can review and search all Notes in their account’s transcript archive. We’ve updated the Olark chat console sidebar to add information and improve organization. The sidebar now has two separate tabs: Profile, which contains visitor details such as name, email address, and browser/OS, and Activity, which contains a record of the visitor’s browsing and chat history, including links to past transcripts. Added the ability to edit user profiles after they've been deactivated. Fixed a bug that caused the chatbox preview on the appearance settings page to not appear in Internet Explorer 11. Improved the loading speed of the visitor side bar for Powerup users. Stopped sending automated email reports if they contained no chat activity. For more information on these tools, and for answers to frequently asked questions about Olark and the GDPR, visit our help center. 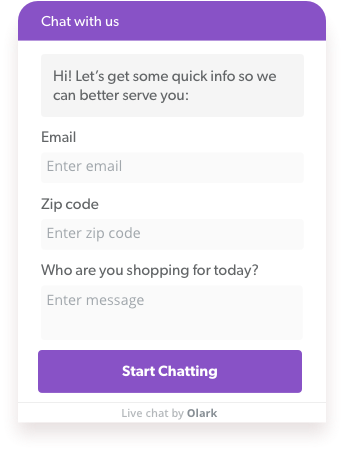 Chatbox forms allow sites to add custom questions to their pre-chat survey and offline email form. As well as the existing name, email and chat fields, you can now add a website field, custom text field (single line response) and text areas (multiple line response). You can change both the question label and placeholder prompt. You can add up to three fields per page, and up to two pages per form. A second page is automatically created when you add more than three fields to a form. The Olark chatbox is now navigable by keyboard using a screen reader and will announce any visual changes, such as new messages, to the screen reader. These updates are part of our ongoing work toward meeting WCAG 2.0 guidelines. Admins can now view today's agent activity. See when agents become available, are away or hit their chat limit. Switch easily between a summary of all agents' chat data or their status activity using the toggle button. Agents can now transfer a chat to another agent, using the updated !transfer command. In the Olark chat console, type out the !transfer command as usual. To notify specific agents that you want to transfer the chat to them, use the @ key to bring up a list of logged-in agents. Hit the return key to select that agent. You can include several operators in the same request. When notifying multiple agents, the first one to respond will be locked to the chat. Agents can be tagged anywhere in the message after the !transfer command. !transfer I think @john or @jane would be best taking this chat. If you are using a third party chat client, you can check your buddy list to see the username of other agents. Visitors can now upload files to the chatbox which will be displayed to the agent in the chat console. File Upload lets visitors attach images and PDFs during a conversation. For a full list of supported filetypes and security features, check out the File Upload documentation. Enabled by default, the feature can be disabled in the File Upload settings. Surely Olark Live Chat will start publishing changelogs very soon.